The largest local car rental company in Costa Rica with best value, since 1990. The company focuses in delivering a complete service at a reasonable price, with no hidden fees and total protection, zero deductible insurance available. 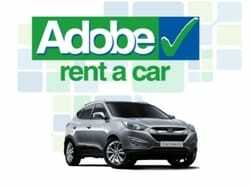 Adobe has one of the youngest car fleet, long term rentals available and with 25 years of continuous success, excellent customer reviews, and among the highest customer satisfaction. Good Service - We can arrange for one of their agents to punctually drop off your car at your requested location and give you all the assistance, road tips, maps, tourist magazines, and advice needed for a trouble-free vacation..
A computerized reservation service guarantees a smooth operation and their fleet of new models minimizes any trouble on the road. If the automobile does not satisfy you, they'll provide fast assistance 24/7 from their road service program with mechanics all around Costa Rica. * Be advised that many car rental companies do not rent to drivers under age 25.